New Delhi, September 20: When you get a reward and appreciation for your work, you are bound to thank the person entitled to it. Expressing gratitude and happiness, a group of 100 Anganwadi workers called on Prime Minister Narendra Modi for his decision on the recent announcement of an increase in honorarium and other incentives. Minister of Women and Child Development Maneka Gandhi was also present at the event. 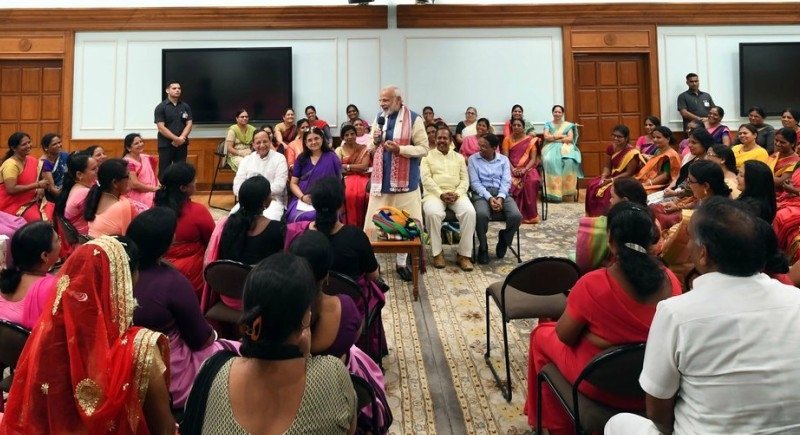 PM Modi, recently had interacted with ASHA, ANM and Anganwadi workers across the nation through Narendra Modi Mobile App where he commended their efforts, to ensure proper healthcare facilities to women and children. Acknowledging the gesture, PM Modi thanked the workers to unite together and have assembled from all parts of the country to meet him. The Prime Minister asserted that the Anganwadi workers play an important role in providing nutrition in built up a child's physical and cognitive development. Underlining the importance of nutrition for the children and their mother, PM Modi said that the job done by the workers is commendable and ensuring proper care is significant. Referring to the ongoing Poshan Maah (nutrition month), the PM Modi said that the momentum that has been built up during this campaign should not flag. He said nutrition requires constant focus and development of good habits, which can be provided by Anganwadi workers. He exhorted them to ensure that the nutritional assistance being made available to beneficiaries is used judiciously. Highlighting the vital role they play, PM Modi said that the children will listen more to Anganwadi workers as they have a key role in generating awareness. He encouraged healthy competition among Anganwadis, as a motivation for better nutritional care and efforts among various Anganwadi workers. Prime Minister Narendra Modi had announced a landmark increase in remuneration for ASHA and Anganwadi workers. PM Modi announced the doubling of routine incentives given by the Union Government to ASHA workers. In addition, all ASHA workers and their helpers will provide free insurance cover under the Prime Minister's safety insurance scheme and Prime Minister Suraksha Insurance Scheme.